Don't let El Shaddai: Ascension of the Metatron's odd name turn you off if you like third-person brawlers. There's nothing better than trying a game you've been looking forward to and having it beat expectations. This is exactly what happened at PAX East 2011 when I tried Ignition's El Shaddai: Ascension of the Metatron. Chances are you've never heard of the game, but if you're a fan of titles like Devil May Cry or Okami, you'll want to pay attention. El Shaddai is a third-person brawler that Ignition's Shane Bettenhausen compared to Ninja Gaiden in difficulty, but it takes place in a world that looks like an animated pastel dream. Players take on the role of Enoch, a regular guy with a super pure heart that God tasks with bringing down 7 fallen angels. To aid in his mission, God suits Enoch up in a suit of armor that he wears over a pair of Levis. That's right, blue jeans. Instead of a health bar, the armor will break down as Enoch is hit. Enoch's pair of jeans evidently gives him plenty of mobility, as the game is very fast-paced. Enoch attacks the bejeezus out of the worst enemies the fallen angels have to throw at him with a set of different weapons. The Arch is your standard sword-type, but it looks more like an energy-based version of Star Trek's Bat'Leth. The second weapon is a set of spikes that float around Enoch and are used for ranged attacks. The third wasn't shown, but is apparently a powerful gauntlet, taking its place as the potential slow, heavy hitter. Enoch begins the game empty-handed and must steal the weapons he wishes to wield from his opponents when they're in a weakened state. He can only hold a single weapon at a time. The Arch must also be regularly purified so Enoch can properly beat up his opponents, but it makes him vulnerable and must be done with good timing. Bettenhausen said the development goal of El Shaddai was to create a brawler that even your typical non-gamer could pickup and play. It uses block, jump, and attack buttons (in addition to a trigger for purification), so there aren't necessarily a lot of combinations which must be mastered. Instead, players will learn to use these three buttons in tandem and throw in delay to perform different moves. You can tap the attack button over and over if you want, but using delay might make Enoch fly over his opponent and strike from behind. The block and attack buttons together make Enoch do an upward slash, while block and jump make him dodge. The precise move performed also depends on what weapon is equipped, with a dodge being a roll while holding the Arch and a quick launch through the air while holding the ranged weapon. I got the hang of combat very quickly, but the varied enemies in the demo weren't exactly a cakewalk. 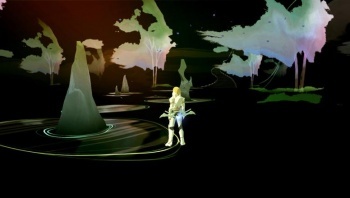 El Shaddai is primarily a 3D game, but a large segment is also played out in a 2D sidescrolling mode. In both modes, platforming skills are required. Players respawn nearby after a fall to the death so it isn't that big of a deal. The 2D segment I experienced was very artistic, with Enoch having to ride waves made of watercolor. Ignition wasn't showing off any bosses other than a fallen angel that couldn't be defeated. However, players can get a better rank even on this boss if they get in enough hits, so no battle is pointless. The black-armored foe was pretty tough, so bosses will likely provide a hefty challenge. The PAX East El Shaddai demo ended with a few clips of the game's future scenes, which looked to vary the game's visuals and introduce a broad cast of characters/enemies. Whether or not it can remain interesting through to the end is up in the air, but Bettenhausen says the game goes to some interesting places in both gameplay and story. El Shaddai: Ascension of the Metatron is planned for release on the Xbox 360 and PlayStation 3 in summer 2011.